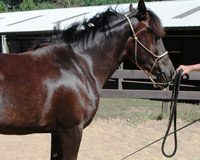 Home Horse Care Horse Behavior Is Your Horse Nervous? Nervousness can account for behavior and training problems, but you can help your horse work through it. Feeling frustrated is understandable when you’re horse won’t stand still as you step into the saddle. Perhaps she spooks easily, imagining boogiemen under every leaf. Common explanations for these potentially hazardous behaviors are hyperactive temperament, insufficient training, or an uncooperative attitude, yet there is a simpler and often overlooked reason that accounts for these behaviors -nervousness. 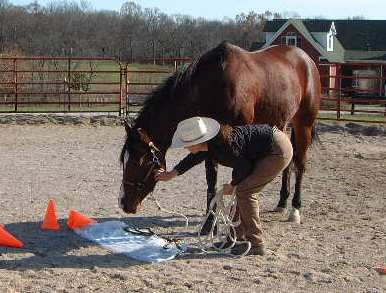 Allowing nervous horses to investigate the environment can help give them confidence. We forget these hefty beasts are prey for other animals, but your horse remembers. A horse acts nervous when she doesn’t feel safe – she thinks she’s being threatened. Her survival instincts have been triggered. That makes a task as simple as standing still extremely difficult. Add to that an unfamiliar environment, and she may come unglued. She is functioning with an active flight response. This instinctual behavior is an advantage in the wild as a horse on the bottom of the food chain. However, when you are trying to communicate with a nervous horse she is no longer thinking clearly or able to respond rationally. In this state of mind, it’s important to regain your horse’s focus and cooperation. Punishment is a traditional means used to correct a horse’s misbehaviors such as not standing still, overreacting to even subtle leg cues, or spooking but it is counterproductive when your horse is motivated by fear or insecurity. A more effective approach is to rebuild your horse’s confidence which yields long term and lasting results. To accomplish this you need calmness, understanding, and reward. You and your horse need to be relaxed. Your horse isn’t thinking productively if she’s feeling nervous. You can easily add to her worries if you are acting nervous too. Have a plan in mind when you’re working with your horse, but let go of expectations – allow your horse to learn at her own pace. Pushing her too quickly or beyond her capabilities will break her trust and add to her distress. Practice deep breathing exercises and focus on keeping your heart rate low while you work with your horse even when things aren’t progressing well. When you need to make a correction, deliver it in a calm way. 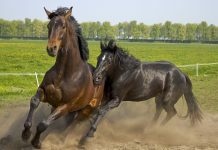 Remember the goal is to lower your horse’s energy level. Try giving her some play time on the end of the lunge or a run in her turn out before you start your training session for a chance to release pent up energy and to improve her focus. It’s important to understand your horse’s motivations, so look at them objectively. Don’t assume she’s trying to be difficult. See her reactive behavior for what it is, an expression of confusion or anxiety. Help her understand what you want from her. If she’s not grasping a concept, break it down into component parts. For example, if your horse won’t stand still when you mount, teach her the act of “whoa” first. Practice having her stand still while you groom her. Ask her to stand quietly on the lead in various locations for brief then increasingly longer periods of time. Then add walking around her as you reinforce the “whoa” cue. Once she performs these tasks, ask her to “whoa” while you position yourself next to the saddle. Next put your foot in the stirrup. Then jump up and down a few times, and once she accepts that you can climb aboard. 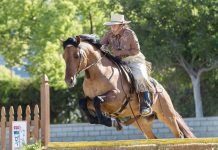 By working through each step then moving forward only when your horse understands and masters the previous task, she’ll capably handle new and greater challenges. If your boss only popped into your office when you made a mistake, announcing you were wrong and docking your pay, that isn’t motivation; it’s punishment. Horses don’t respond well to punishment either. They need your reward for each job well done. This creates and reinforces desire to repeat the behavior again. Give your horse a clear reward every time she does what you’ve asked her to do. A special enthusiastic “good job!” or whatever verbal recognition you decide to use. Then back that up with a scratch on her favorite spot. That will further motivate her to repeat the desirable behavior while strengthening her connection with you. My gelding gets that way, but I calmly tell him “you’re okay” while looking him straight into the eye. When he looks back to me, I know he’s focused and he relaxes. Then we go to the scary thing to check it out. I have a horse that gets very nervous, out of her pen/pasture, so I let her eat out on the lawn and take her for walks, and now she enjoys coming out of her comfort zone. Great advice. Both my horses know the word “calm” and they believe me!